Integration is the key. Combining. Overlapping. Interlocking. I am better focused now after speaking with her. I have clarity again. I remember my bigger-picture goals and I feel like i’m back on track. Taking a walk with a friend and bringing the dogs along, rather than always just going out to dinner = fun + chores + health. Photographing a project I do for work, or bleeding the project out into one of my own journal quilts or blog entries = work + creativity + fun. Taking the stairs, avoiding the cookie counter at work, and planning ahead for snacks = work + health. At least I made sure not to overlap the dating stripe into the work wedge. Some things just aren’t made for integrating. I recently reviewed Mihaly Csikszentmihalyi’s book, Flow, the Psychology of Optimal Experience. In it, Dr. Csikszentmihalyi describes what he calls “optimal experience” — being so involved in an activity that you lose sense of time, place, and self. Others call it the Zone. For most of us creative types, I think this flow experience is what keeps us coming back and back and back to our projects. But, flow as described in the book is not just “having a nice time.” It is a powerful force, and can contribute to better mental health, greater individual complexity, and growth. A challenging activity that requires skill but is achievable. The merging of action and awareness. Concentration on the task at hand (which “removes from awareness the worries and frustrations of everyday life). A sense of control over your actions. It seems to me that items 1-6 are at least somewhat in our control, and are elements that we can manipulate and employ in the service of achieving flow, while items 7-8 are really measures of the flow experience. They are indicators that we have achieved flow. Utilizing these principles, I’ve been able to make deeper and more powerful connections to everything from my artwork and writing to watching sports with friends and enjoying a concert from a performer whose music I didn’t know. I’ll spend some time over the next few weeks talking about some of these elements in more detail, but for now maybe we can take some time to consider the importance of goals, feedback, and internal locus of control can be on our enjoyment of activities. These elements are fairly inherent in art-making of all kinds. In some ways, we are lucky to have such a powerful tool for growth and change at our fingertips. What about you? Please share with us — when did you last experience flow? What were you doing? How did it feel? I don’t own an iPhone. Like most outsiders, I occasionally have envy, but perhaps never so much as I do after hearing about an iPhone application called Brushes —software for digital paintings that can be made at any moment on your tiny screen. There is a flickr group dedicated to the images, and the application has received a lot of attention lately because the latest cover of New Yorker magazine was painted on it — using nothing more than an expensive gadget and a fingertip. Predictably, “fine artists” are balking. The age-old question, “But, is it art?“ is being ponged around the globe. I used to have an art therapy professor who insisted that if you didn’t get messy making it, it wasn’t art. It’s portable. You can always have it with you, unlike your fancy easel, your sewing machine, or your favorite buzzsaw. It’s small, which means that you are more likely to finish what you start. It has an undo function, which creates an illusion of safety in risk-taking and may encourage experimentation. A special viewer allows you to replay your painting, stroke by stroke, which is a neat way to honor, reflect on, and celebrate artistic process. In addition to having the most unpronounce-able name in all of western psychology, Mihaly Csikszentmihalyi is also one of the most prominent “positive psychology” theorists and researchers around. It’s no surprise that his book, Flow: The psychology of optimal experience, describes the “state of concentration so focused that it amounts to absolute absorption in the activity.” What might surprise you is Csikszentmihalyi’s claim that flow (optimal experience) is not elusive or mysterious, that it doesn’t just come and go at random. Rather, he asserts that flow can be cultivated, courted, and put to use in our self-development. I’ve chosen to re-read and review this book because I think that so many of us art-makers have experienced flow, and could benefit from Csikszentmihalyi’s ideas about how to create it and experience it more often. I’ll cover some of the book’s content below, but you can skip directly to my opinion if you prefer. Maybe it’s odd, but I love to organize things in rainbow order. Actually, I’d consider it a kind of coping mechanism. When I get really stressed, something about that old ROYGBIV just soothes me. When I was little, I would sort everything from t-shirts to pencils to food in this color order. I would line up candies in a spectrum row before I would eat them. 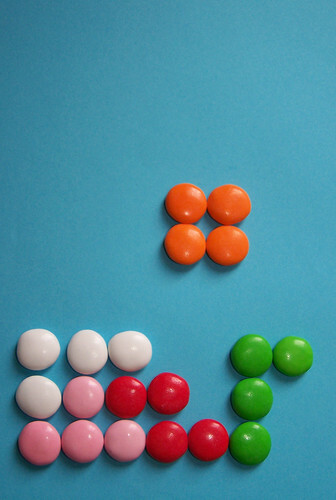 M&M’s and Skittles frustrated me because they didn’t have all the right colors. Now that I’m older, I don’t have time to be quite so obsessive about it, but most of my art supplies and clothes are still sorted this way. Tetris vs. Pong: A question of creativity? While listening to NPR radio the other day, I learned that the ubiquitous video game Tetris turns 25 this year. The game’s original programmer, Alexey Pajitnov, was interviewed and mostly ended up talking about the experience of trying to own the rights to his creative work, which was conceived during the 1980’s in communist Russia (and which probably explains that awesome theme music). Well, while that raises all kinds of interesting questions about who owns creative output, what really caught my attention was a throw-away question toward the end of the interview. BOB GARFIELD: Now, I have to go back to the ’70s, actually, and I remember playing one of the early video games called Pong, which was developed by Atari. And when I think back to how ridiculous I was, to be putting quarters into machines in video arcades, to play that game, you know, I feel like an idiot. But I don’t feel like an idiot, going back to my first experience, more than two decades ago, with Tetris. Why does this game have such legs? ALEXEY PAJITNOV: Well, many people have different opinion about that. But I still like Pong, and I wouldn’t mind to put couple of quarters to enjoy it. I don’t see anything wrong with it, by the way. But as far as Tetris is concerned, the game is very simple and it has very natural user interface. It has some kind of creative style. In most of the game you just shoot and destroy. 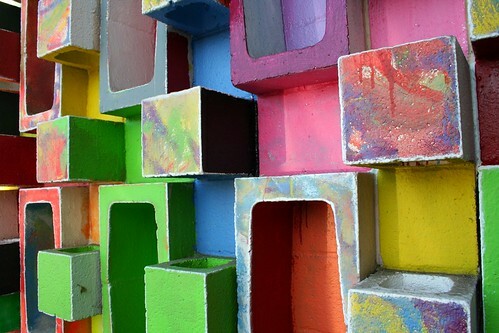 In Tetris you try to build something, to put the order in the scales of random pieces. And probably that’s what make you feel a little bit better about what you’re doing with your quarters. Tetris is a simple video game, yes. It can be addictive and a tremendous waste of time. It does, however, require some creative problem solving. There are a multitude of ways to solve the problem of tetris. It is, as Pajitnov notes, more about building something stable than tearing something down. Pong is not about destruction, but is a game requiring some skill and minimal creative problem solving. Playing it can quickly turn into a boring, repetitive tasks. It has had very little staying power in terms of popularity and perpetuation — and why would it? Who needs more boring repetitive tasks in their world? As an interesting note, if you search for “tetris” on flickr, you’ll find all kinds of crazy creations — tetris halloween costumes, cupcakes, even jewelry! Searching for “pong,” on the other hand, returns mostly images of the original game, its packaging, and other retro-philic stuff. Does tetris itself encourage more creativity? More building and making? There is a recent study that suggests tetris may help to ameliorate the effects and memories of trauma. Is it the videogame that does it? Or is there something inherently healing about using that creative part of our brains? We may never know, but I think you know where my bias lies. To me, this building something — this making order of my world through creativity — pays great dividends. Like Pajitnov, I do feel better when I spend my “quarters” on pursuits that build rather than destroy. It’s a privilege to spend these coins of time, effort, energy, and other resources which are in short supply on building a creative life. I’m honored that so many of you chose to respond, as this is a topic that we all have to confront from time to time. So, here is a breakdown of the recurring themes in your answers, in order of popularity. 1) Squeeze creative time into small moments, whenever you get a chance, such as between other chores. Here, we have the “just do it” approach. This was our most popular answer — take advantage of small opportunities that present themselves most every day. I make time by not waiting until I have a big block of time. I used to think I had to have a dedicated chunk (like 2 hours or more) to get anything done. But now I just keep a running list of bite-sized tasks, and if I have 15 minutes, I do one. The next time I have 15 minutes, I do another one. It adds up, and I’m getting a lot done! I also find that this lets me have multiple projects going at once. If I don’t feel like doing task 5 for project A, maybe I can do task 2 for project B instead. 2) Ignoring other “important stuff” — this includes things like housework, social obligations, and other negotiables but also includes neglecting things like sleep, cooking, and health issues. I’m not sure I can advocate this technique, although it certainly seems to be common! Christine’s entry makes me laugh, but many of the comments in this category are a little concerning. I make time for making by leaving out non-essential things like eating and sleeping. Haha, sane? No… chocolate covered bridge mix helps with the eating, the sleeping problem? Haven’t figured that one out yet. I can’t help it that I sometimes stop quilting because my foot is cramping up and see that it’s 1am. Oops, how did that happen…? 3) Have a schedule, make dates/appointments with yourself. This is something that I will probably never be able to have any success with, but I’m happy that it works for so many of you! When I see a free day on my calender- I try to actually make an appointment with myself. It helps me not have any excuses with other tasks. When I find 5 or 10 min a day that I don’t have anything going on I check out the web- blogs, flickr etc for inspiration so I’m ready for the days I plan to be away from technology with all these mental images and sketches that come from them! 4) Cutting out TV or time on the computer. ULP! I make time to ‘create’ by GETTING OFF THE COMPUTER!!!! I spend so much time admiring stuff online; it does inspire me, but I just keep reading and playing. 5) This wasn’t necessarily a “popular” answer, but it is probably my favorite one and one that I would say has been true in my life recently: Broaden your definition of creativity. How do you make time for making? It seems I never stop “making”. I see patterns everywhere I look. 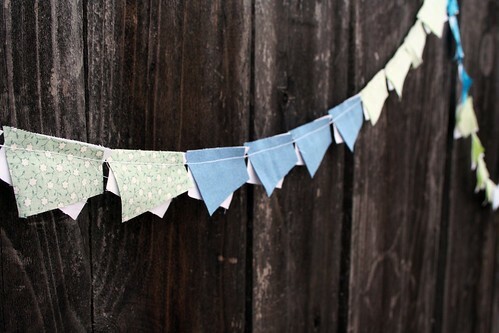 I dream about sewing. My color favorites are seen in the Fall season. A field of wheat waiting for cutting, pale blue sky and the turning leaves are my pallet of colors. I set rules for myself. A little housework then the reward of sewing something. 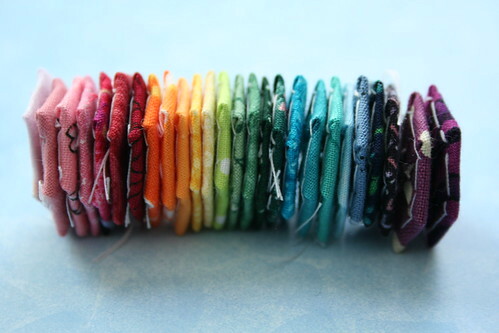 I even find joy in super-cleaning my sewing machine or winding a box of bobbins so I am ready to go with the next rush of sewing. 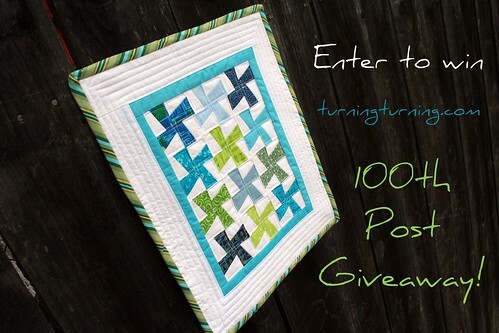 Congratulations to Casey of Casey Random who wins the mini quilt with her email announcing that she had earned the bonus point. 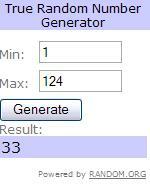 All of the entries — comments and emails — were lined up in my email folder and Casey’s was number 33. This means that Casey commented, twittered, subscribed, and blogged. Go Casey! Honorable mention goes to Tracy of Unfolding Moments who wrote an entire blog entry inspired by the question. If you haven’t answered the question yet, please share: How do you make time for making? Does it fit into one of these categories? When I wrote my About page, I laid out out my intention for this blog. This is not a blog about one particular medium or another. This is not an assembly line of amazing and flawless creations. This is not a business site designed to promote a book or a business or a product. This is a place for exploring, discussing, and considering the creative process — the power of making — and its place in modern life. In recent weeks, you’ve seen me trying to puzzle through this business of modern life and how to fit creativity into it. But what exactly do I mean? What is modern life and why is it so difficult to make time for making? I guess by “modern life” I mean this whole fast-paced thing — this overscheduled, overcrowded, convenience-driven attitude that is popular in our culture. In the old days, people created because they had to. 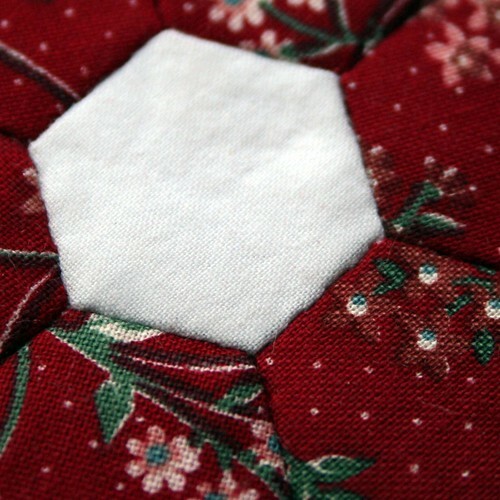 Women quilted because their families needed warmth. They baked because their families needed food. Men fashioned their tools and laid out their farms so that they could eat. Women cared for children, men cared for plants and livestock. All were involved in the slow, steady work of nurturing life, and of making things, and of getting through. Nowadays, why cook when we can pick something up at the drive-thru window? Why make blankets when we can buy them at Wal-mart for $3 a pop? It takes so much time to cook, to quilt, to paint or string beads or write poetry. Why labor over a hand-bound book, a tile mosaic, or a plein air painting when you can so cheaply pay someone else to do it? Paying will surely free up our time. But what do we do with that time? Well, a lot of us work harder to earn more money so we can pay for more conveniences. Money will buy time. If I could pay someone to do my laundry for me instead of sitting in the laundromat for 3 hours a week — to do my cooking and cleaning, my car maintenance, and my dog walking for me — why, I could travel the world with my sketchbooks and do nothing but create. But, the only way for me to have funds to pay for convenience is to work more. Working more means less free time. That must not be the solution. If I wish to dedicate more time to things that are important to me, I first have to know what those things are. I have to set my priorities according to my values and be prepared to make decisions every day — every hour — to keep myself in line with those priorities. One of my values is a core belief that making things enhances and improves my life. I have worked this year to make making a priority in my own life, and not just in the lives of my art therapy clients and patients. And so, even when I’m tired, or have had a long day at work, or am being jostled about on the subway, I try to make something. When I am upset or sad or sick, I try to make something. When I am happy, excited, or anxious, I make. Making is my priority. I separate my values from my priorities. Values are things I believe. Priorities are things I do. They are the areas where I choose put my time and energy. Knowing my values helps me set my priorities. Priorities are my filtering system. They help me organize my time so that I can live a life in line with my values. Is that circular enough for you? I try to limit my list of personal values, priorities, and such to only 3-5 at a time. That’s not to say that I only believe in 3-5 things, just that I don’t want to actively be working on more than 3-5 areas at a time. More than this just gets overwhelming and probably sets me up for failure. I don’t like failure. My list is always in flux. What is important to me today may not be as important tomorrow, so it’s important to revisit it frequently. If I were to have children, for instance, this list would be likely to change. What about you? What are your values? Your priorities? Where will you spend your time and energy today? 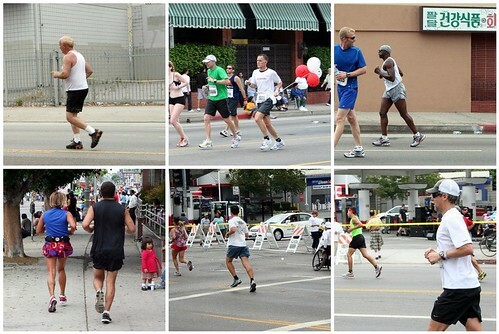 This week, my city hosted a marathon. Since I moved here, I have wanted to go downtown and be a spectator of the marathon — to vicariously experience the emotions and triumphs of the thousands of people who undertake this superhuman feat. So, I woke early and watched the television coverage while I dressed — the starting line of the wheelchair race, the “elite” men and women duking it out to the finish line, the weather reports and sports commentary. But, this is not an essay about the starting line or the finish line. It’s about everything that comes in between. Once I had my fill of enthusiastic starts and dramatic televised finishes, I grabbed my camera and bound for the train. I had chosen a viewing point for transportational convenience (closest to the metro that I am familiar with) so although I wasn’t sure exactly where I was along the route, I knew I could get some pictures and enjoy the feel of the event. When I realized that I was standing at Mile 24, just 2 miles from the finish line, I was flooded with emotion.I stood and cheered and clapped. I yelled, “You’re almost there! You’ve done it!” for an hour or so. I comisserated with my fellow on-lookers and enjoyed the live band and generally marveled at the people in front of me who were still running — still plodding one foot in front of the other — in spite of the pain they must have been feeling. But, I’m not really writing about the pain, either. 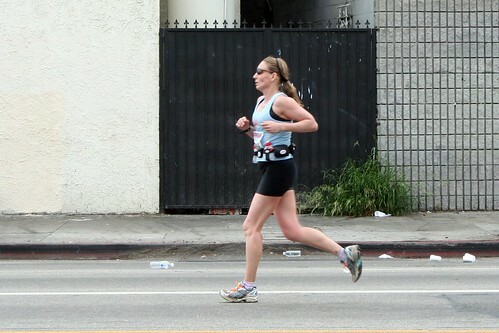 What most impressed me was that 24 miles ago, the marathoners had started taking steps. That’s all. They just took one step, then another. Most of them in this non-elite group were alternating between running and walking, even sometimes stopping to stand still at the water stations. They ran over to the sidewalks to hug their families and friends. But, in general, they made a gradual eastward progress. They were still at this business of taking steps, long after the excitement and energy of the starting line had past. And that’s what distinguished them from the spectators, besides their numbered bibs. They were actively moving toward their goal. They took one small step, then another step, until they were done. Sure, there were a handful of “winners” yesterday who took home special medals and money awards. 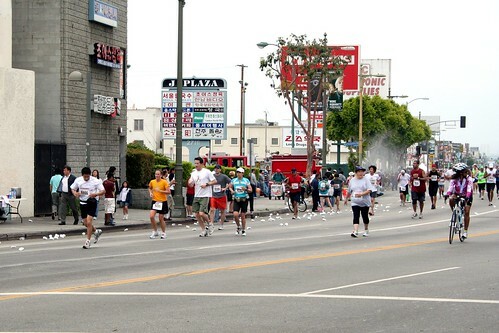 But, for the most part, thousands of runners were just trying to finish. They were fighting only against themselves and their environment. They weren’t looking to the right or to the left to see how anyone else was doing. They just kept taking one step, and then taking another step, in a solitary journey. They did this in spite of being older than those around them. They did it with a cause, from a wheelchair, and in spite of all distractions. They slowed down and looked back to see how far they had come, but they didn’t stop taking steps. I love this lady. She has all of the fancy gadgets — a virtual Bat-belt of snacks, water, and stride measurers. But guess what? Even she wouldn’t make it to the finish line without taking one small step at a time. …let’s face it — some days it’s all I can do to make something other than a bowl of chocolate ice cream for dinner. Some days I am happy if I make my bed, wash my hair, tie my shoes. 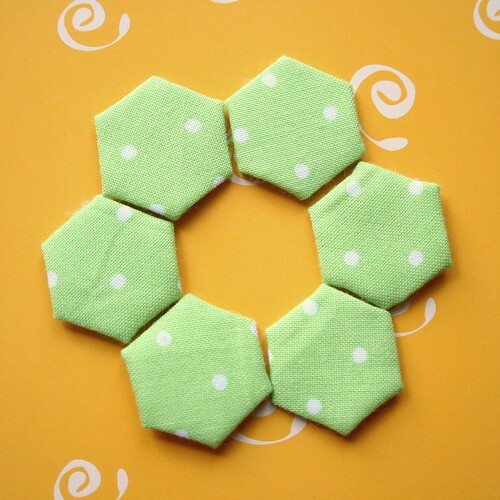 Some days, I feel extremely lucky to have sewn one bead, one green loop, one hexagon seam. All you have to do is take one step, then another step. 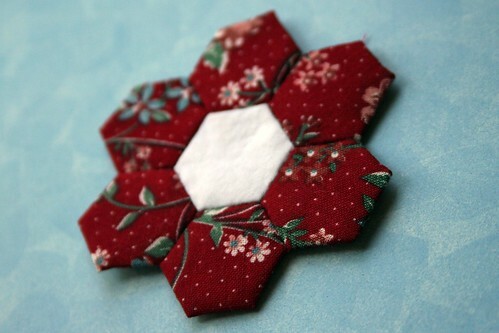 Someday I will finish my hexagon project. Do you know why? Because I am dedicated to pulling it out for 10 minute spurts on the subway. Because I sew a seam here and there, whenever I get a chance. Because I work on it a little, then I work on it again. I enjoy the process, not just the completion. This is how most of us fit creativity into our modern lives. For my part, I’m going to stop wishing for a miracle — for a millionaire to marry me and magically remove those limitations of time and space and money. I’m also going to stop looking around me to see just how fast everyone else is moving. Instead, I’m going to focus on what I can do today. And, if it’s just one small step, well shoot. 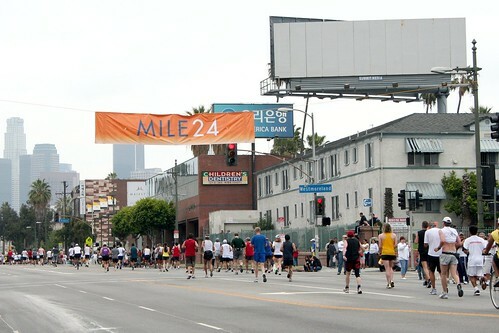 Mile 24 awaits. What small thing will you do today? We’re all clear (aren’t we?) that these “What to do” essays are letters to myself — internal pep talks that I make external. And here is something that I am guilty of doing very often: holding back. One of the few things I know about writing is this: spend it all, shoot it, play it, lose it, all, right away, every time. Do not hoard what seems good for a later place in the book, or for another book; give it, give it all, give it now. The impulse to save something good for a better place later is a signal to spend it now. Something more will arise for later, something better. These things fill from behind, from beneath, like well water. Similarly, the impulse to keep to yourself what you have learned is not only shameful, it is destructive. Anything you do not give freely and abundantly becomes lost to you. You open your safe and find ashes. The idea of this post came to me in the early hours this morning. It was about 5:00, and the soft buzz of dawn was just beginning to grey. I was curled up with the dogs and mentally reviewing the wins and losses of the past week. The smaller dog wasn’t stirring yet, but the older one had already joined me for our wake-up ritual. I didn’t have a photo to accompany the post anyway. Surely I would by Tuesday. As I rushed around — showering, brushing, ironing, eating — I cast about for an image. I searched, in vain, for a particular trinket that I thought would work. (Turns out that it wouldn’t — you’ll see it come up later.) As I washed breakfast dishes, I remembered these empty pill capsules and had an idea. By the third time I caught myself standing in my own way — trying to convince myself to hold back what was clearly a good idea — I knew that this was exactly the essay I needed to post today. Anything else would be false, would be stopping up the flow. To hold back would demonstrate a lack of faith that something equally good or better will come to me by next Tuesday. And, it’s possible that nothing will! But, it’s a risk I’m willing to take. What are you holding back? Are you willing to spend it today? Some days are just like this, I guess. Some days I feel all stretched out and strung — like a too-tight banjo that’s been hammered on for hours. Like a hurricane blowing out in every direction, a circle of destruction. 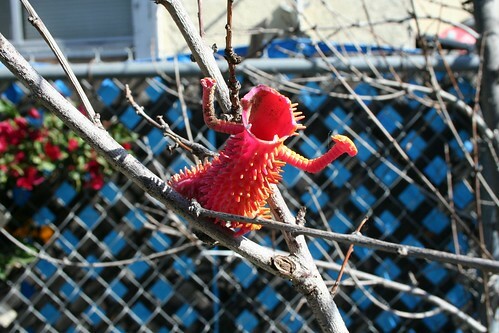 Like that plastic monster from my yard who battled valiantly and lost — plaintive and empty. How we spend our days is, of course, how we spend our lives. What we do this hour, and that one, is what we are doing… Each day is the same, so you remember the series afterward as a blurred and powerful pattern… There is no shortage of good days. It is good lives that are hard to come by. I started this blog with a few different aims and purposes. One of them was to have an excuse to be making things — an accountability to myself that I would create art in my free time. I wanted to honor my mission of bringing art and creativity to other people’s lives by also bringing it to my own life. To have that little extra push. To find and make time for creativity. And, let’s face it — some days it’s all I can do to make something other than a bowl of chocolate ice cream for dinner. Some days I am happy if I make my bed, wash my hair, tie my shoes. 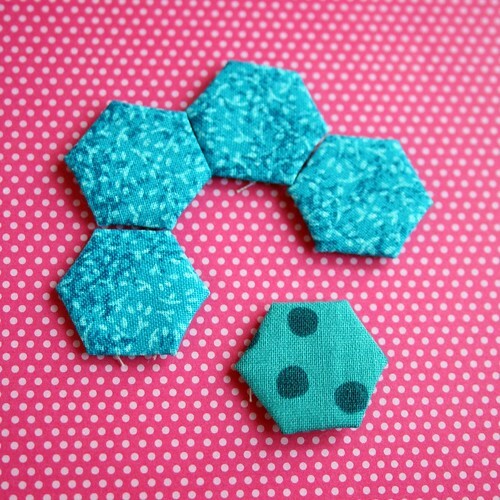 Some days, I feel extremely lucky to have sewn one bead, one green loop, one hexagon seam. At work, I am the boss. I head up a team of people who bring the arts and creativity to those in need. I don’t always get to see patients, though in general I wish I could sit every minute of every day, with the suffering and downtrodden. Instead, I sometimes spend eight hours a day writing reports, grant proposals, and performance reviews. Compiling statistics. Oh, and I answer e-mails. So, so many e-mails. I supervise my staff, making myself available to discuss their triumphs and failures. I build bridges in hopes of building bigger bridges. Bigger bridges lead to new lands and unforseen challenges. But, it’s all in the service of a greater purpose. I have a clear vision for where I want to go with my little department, and I chip away at it one day at a time. I also have a vision for my life outside of work, though it is not always so clear. I try to maintain a social life, courting the someday-fantasy of having a partner. I budget my money, trying to get out of debt. I attempt to eat right and exercise so that I can continue to lose weight. (Last year I lost 80 pounds, but I still have more to go.) I maintain contact with my huge and expanding family. I care for the dogs. I clean and wash and fold. I sit. I rest. I shower in the dark. And, I guess that’s what Annie Dillard is trying to say. Maybe I don’t finish a quilt in a day or participate in all the swaps and challenges and trends and movements. 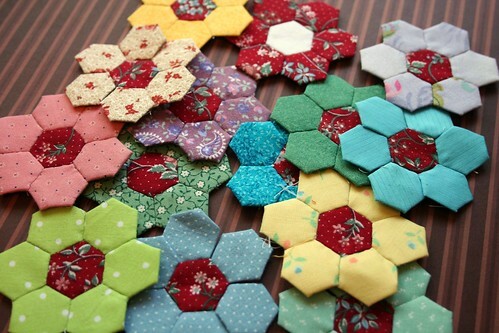 But, if I sew two hexagons today, and one tomorrow, eventually they start to build up. Today piles on top of yesterday and forms the base for tomorrow. It all blurs together into a pattern, just like Annie says, and I want the pattern of my life to be about compassion and creativity and community. So that even on days when I am only able to do the very smallest thing, it’s okay. As long as I am facing the right direction, contributing somehow to my life’s larger purpose, stringing together my days, my stitches, my pencil marks, and my paint strokes into a life of creativity, then that’s what matters to me. What about you? What small thing did you accomplish today in the service of your bigger vision? I hope you’ll share. 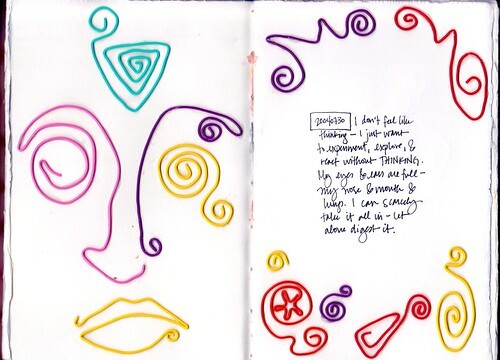 As I was looking through some old journals, I got a needed reminder about experimentation. These scans are from an older journal — artwork done on a Mexico trip a few years ago. I mentioned when I posted some of my Mexico pages a few weeks ago that I had gone on this trip without taking a camera. 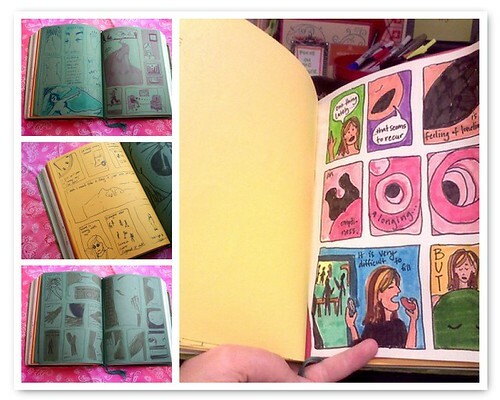 That’s how serious I was about visual journaling at the time. But, I didn’t just sketch and paint in my journal. 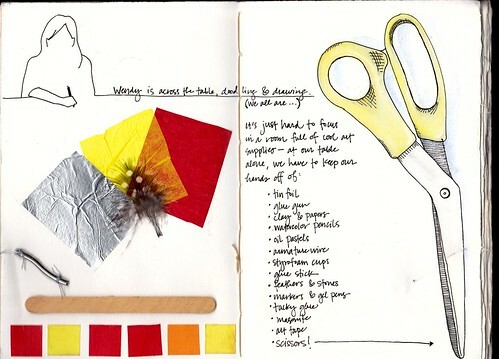 At that time, I was so into visual journaling that I started to push the boundaries of what could or should be included in a journal. In a bound book. On paper, even. The spread above has shapes I made from some colored wire that I found. 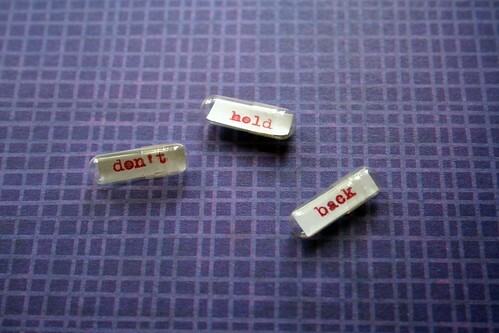 These are attached to the page with glue. Later in the book, I attached another wire sculpture to the page with stitches. It’s wonderful. What happens when we push the boundaries between the expected and the unexpected? The possible and impossible? The traditional and non-traditional? We can end up with tin foil, popsicle sticks, and snippets of armature wire stitched into books (as above). Swatches of colored masking tape. A traced-around pair of scissors. We invite happy accidents. We shake off experiments that don’t quite work. We move on. 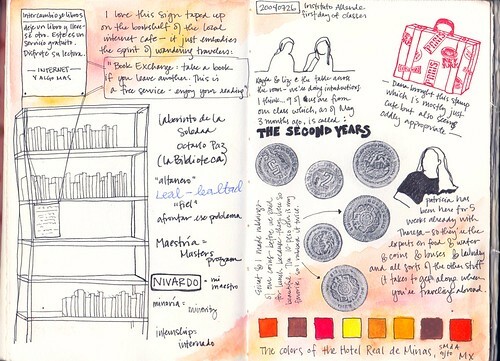 On this page, I remember I really wanted to include some of the Mexican coins in my journal. They were so beautiful — so much more artistic than our boring, patriarchal, American coins. I tried several ways (glue, tape, etc.) but each time, the coins fell out. So, instead, I made rubbings of the coins, cut them out and pasted them into the book. I’ll never forget the cafe where I sat as I worked on this. It’s not something I would have ever done before, but I was experimenting. I don’t have other great words of wisdom on this today. As you can see, these pages were made almost 5 years ago. Today I feel somewhat overwhelmed by issues at work, the sort-and-purge project at my apartment, a complicated social life and (of all things) budgeting. But, I am reminded that sometimes experimenting — pushing the boundaries of what we are accustomed to — is a quick little pathway to freedom. Things got better when I finally got over myself and stopped complaining about having imperfect conditions — about not having enough time or space or energy to create — and just made do. Recently, one of my employees has run into the problem of not doing things because he can’t do them “perfectly.” Here’s an example that he doesn’t mind me sharing. I had to tell him about what has happened in my art journal recently — about how comic strips have spontaneously begun to crop up, and are made with crude pens during jostling, cramped subway rides. I told him about the ugly paper I was using and the limitations of my drawing abilities. I told him to stand up, take whatever paper we had available, and just make do. The truth is, very few of us will ever have enough time or space or energy. We will, for the most part, not build a perfect studio space (though some of us will), or have a perfectly encouraging family, or be able to quit our day jobs in pursuit of art-making. 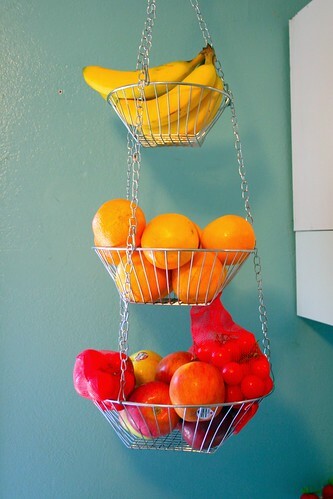 The trick is to make do with what you have. The painter, Paul Klee, actually felt that working with limited options increased your creativity. Maybe the perfect shade of green would turn your painting into a masterpiece — but it’s 2 weeks to payday and all you’ve got are yellow and blue. Make do. You’ve been wanting to start a journal, and spend hours online researching leather-bound notebooks, expensive pens, and carrying cases. Stop it. Make do. Maybe it’s time to help out the planet by making cloth bags to take to the market, but you are worried that the fabric in your stash is not sturdy enough, it doesn’t match, or you need 4″ more. 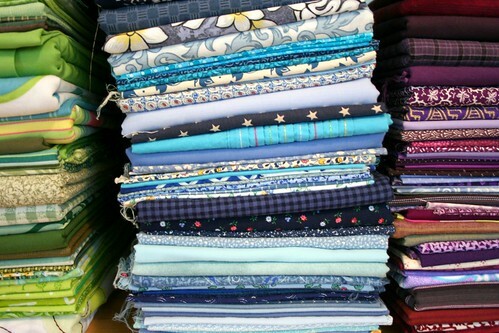 By the way, there’s enough fabric in your stash to make two hundred market bags. Make do. 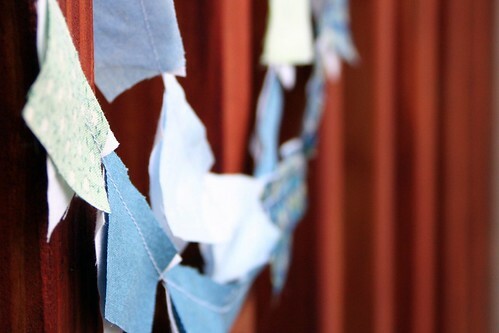 In the spirit of making do, Craftzine spent a month focusing on mending — fixing it up so we can wear it out. Frugaldad wrote a great essay about what it means to have enough. Andrea of Superhero Designs has some thoughts for those of us who don’t think we do enough. Jen Gray lovingly wags her finger at those of us who wonder if we are good enough. Ralph Marston has a self-help-y essay on actively deciding what enough means. Nutmeg of Another Nutter talks about Nuffism — the philosophy of having enough. This is a bit of a long story, and it ends with my date thinking that I fell asleep on my feet at a Bruce Springstein concert two weeks ago. But don’t worry — that’s not the punchline. I started wearing eyeglasses in 1st or 2nd grade. Since then, my eyesight has gotten steadily worse and my vision prescription has gotten steadily stronger to compensate. I don’t want to be overdramatic — I’m not legally blind. But sometimes I do emit a little bat noise to make sure I don’t hit anything in the dark. Without my glasses, I cannot see my own shoulder clearly. Everything from my mid-sternum down is blurry, so I would guess I have a sight range of about 6 inches. I’m a very visual person. In fact, you could say that a natural proclivity plus years of art therapy training have made me hyper-aware of visual details. But, something odd happened a couple of months ago as I was leaving work. I don’t know that it was a particularly long day at work, but I was tired and a little stressed. I stepped out of my office and, without thinking, took off my glasses and perched them on top of my head. That’s an odd thing to do, I thought, but kept walking through the blurred haze. In fact, I walked all the way to the subway in this near blindness. That blurry walk was so relaxing, so carefree, so quiet that I felt completely renewed. I was free from the need to process everything, to catch every detail, and to see. The stress of work seemed to fall away from me, like so many chunks of broken crust. So, I began to experiment. I walked blind to the subway nearly every day after that, and each time I did, I felt refreshed. When I deprive myself of visual acuity, it disengages a part of my brain that chatters at me non-stop. I no longer wonder Where did she get those shoes? or Why did he look at me that way? or Is that person in pain? or They look lost; should I help them? Instead, I get reconnected to breathing and centering and just walking. Sure, I think a little bit about not tripping or stepping on invisible-to-me gum, but only a little bit. I think about the basics. I eliminate the distractions and am left only with myself. I’ve started to experiment with un-vision-ing in other settings. To unwind before bed, I now take my shower with the lights off. 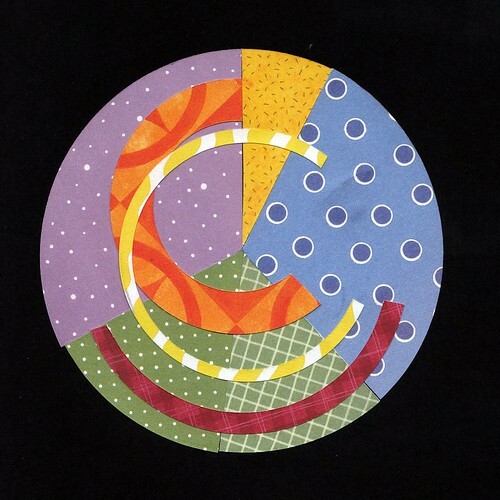 This intense experience reduces the sensory input to an almost raw and primitive state. I become hyper-aware of my body sensations, the pounding rhythm of the water, the steam and the shadows. I shampoo, soap down, rinse, and all the while am relying on my body to judge my place in space and time. I don’t know exactly why, but this not-seeing quiets everything down and I sleep marvelously well. 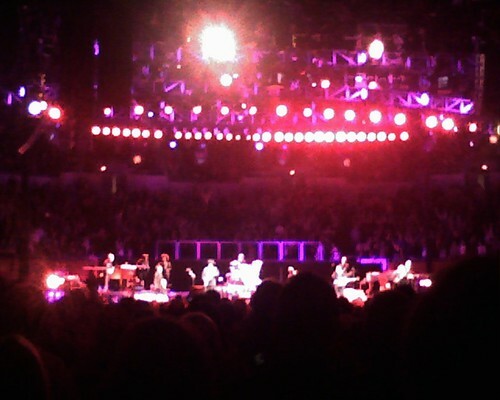 When I was invited to a Bruce Springstein concert a few weeks ago, I decided to go even though (a) I’m not really a Bruce fan per se, (b) it was on a weeknight after a long day of work, and (c) the tickets were general admission which meant close proximity to the stage in exchange for two-and-a-half hours on my feet. My date was a rabid Springstein fan who has never missed a Boss concert within 100 miles. By the time the show started I was already tired, and a little cranky, but I was determined to enjoy myself. It wasn’t too hard — there was plenty of good people-watching and my date was a really nice guy. Soon, my therapist-brain began to formulate theories about the people around me based on body language, clothing style, and interactions. The show itself was visually interesting — lots of lights and staging and imagery. I was hearing each of the songs (even old classics) for the first time so I know I was missing a lot of the messages and meanings. Although I was entertained with these little games, I couldn’t help but feel a little bit like an outsider in the sea of fans — each singing along to every lyric, jumping up when everyone else jumped, and pumping their fists in the air. I sighed, long and loud. I tried to exhale the stress of my workday, my aggrivation at myself for agreeing to this event, and my hyperawareness of the clock. Only 142 more minutes to go. As I exhaled, I shut my eyes. When I did, I felt a surge of electricity. I did it again. Within moments, I was caught up — swept away in the same unifying undertow that had already washed over everyone else. No, I didn’t know the lyrics. I was still tired. But I was lost in a surge of rhythm, beat, vibration, release. I felt my body in the midst of it all. I was aware of my skin — the place where my body meets the world — but I lost my sense of self and became part of the rush of the crowd. There was only me, and my breath, and my vibrating sternum, and the balls of my feet, and the roar of the crowd, and the energy of ten thousand people all riveted to the same purpose. I danced, and crooned, and roared, too. And then I stood very still, eyes closed, leaning against my date. What to do when everything is coming out wrong? What is wrong anyway? Is wrong inherent? Or does it just mean that things aren’t lining up according to my preconceived (and perhaps somewhat pompous) expectations? 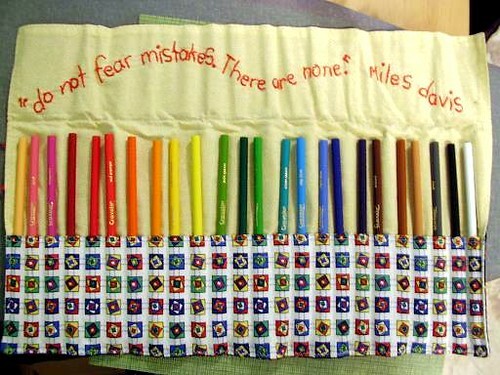 I made this pencil roll for a friend of mine. I thought it would be neat to have this reminder be really present (like, literally present) every time she went to make art. It’s an awesome idea, except for the fact that of the two of us, I’m the one that needs the reminder. Megan of Ghost Academy did a series of posts called Squashing the Stinkers where she takes some of her previous work and redesigns, fixes, or makes it better. At the end, she decides to just discard some of it, which is a post for another day. Awesome. France of Wagonized posted some of her less-loved sketches. How many of us wish we had toss-aways that looked like hers? Charlie of Productive Flourishing lists 21 quotes about persisting through failure and mistakes. These are definitely worth reading, from the likes of Thomas Edison, Keates, Joyce, Roosevelt. I mean, there is some really good stuff there. 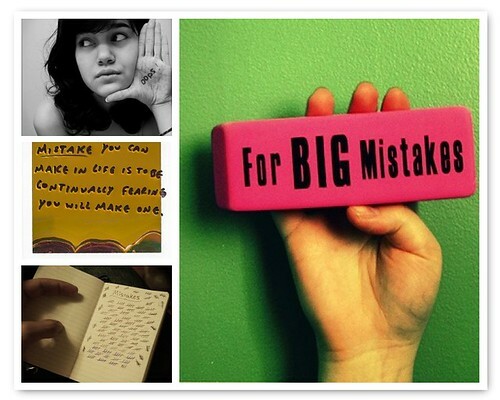 Laura Smith faces the fear of “messing up” (I found this article first on Accidental Creative). A book title caught my eye recently — Failing Forward: Turning Mistakes into Stepping Stones for Success. I have no idea if it’s any good (and probably won’t read it to find out) but I liked the title. Have you read it? There’s no end of self-help-y books and articles on this topic. If that’s your thing, you might start with one by Ken R. Harness called, simply, “Don’t regret past mistakes. Embrace them.” Like most self-help stuff, though, you can pretty much get the whole message from the title. The title is the point: embrace your mistakes. The PBS Series Craft in America is available on DVD and I rented it through Netflix. It contains one DVD with three “episodes.” I’ve caught snippets of the episodes on my local PBS station, but was under the impression that the only way to get your hands on a DVD was to pony up during the pledge drive. Silly, silly Mal. It can also be bought on Amazon.com. If you like, you can skip my review of the content and get right to my opinion on it. The three episodes, beautifully and cinematically directed by documentarian Dan Seeger, are called Memory, Landscape, and Community. I was especially touched to find that the intricate theme song of the series is Simple Gifts — the lyrics of which are the inspiration for my blog’s title. Before we get going, it’s important to mention that when this documentary speaks of “craft,” they are not necessarily speaking of pompoms and glitter. 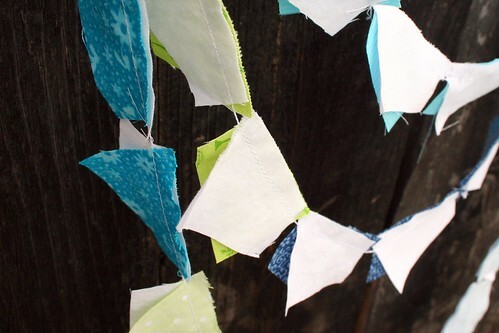 These are not camp crafts or kits or any other type of “quick and easy” projects that you can buy at Hobby Lobby. Rather, the emphasis is on practical, durable, hand-made items and the artists who make them. It is a documentary about hand-made products which highlights the making process. That’s what I ultimately like about it. This episode features two furniture makers, two basket makers, and a blacksmith. Glass, clay, wood, fiber, metal. Human hands transform humble materials into works of function and beauty, creating objects that hold the memory of who we are as people. How are the traditions of craft kept vital by today’s finest artists? And how has the legacy of craft been re-imagined as a modern art form? There is discussion of the Industrial Revolution and the rise of the Arts & Crafts Movement. I appreciate its emphasis this episode places on learning from (and breaking with) the traditions of the past.For instance, at one point the blacksmith, Tom Joyce, talks about how he spent years learning the traditional skills and techniques of metalwork before he could branch out into more modern and “artistic” applications. The basketweavers are both grounded in the traditions of their ancestors (African American slaves and Native American Indians, respectively) but have found a great personal meaning and purpose in their modern creations. As may be expected from an episode called Memory, there is also a lot of talk about handing down traditions and questioning those who came before. This episode features two jewelry designers, another woodworker, two ceramic artists, and a ski lodge. Seriously. Sweeping pastoral vistas. The refuse of city streets. The limbs of a particular tree. The headlines over the morning paper. Artists look to the world around them for inspiration. How does landscape influence the act of creation? And how do artists translate this influence into a landscape shaped by their own hands? We are invited to reflect about our surroundings and how they contribute to the process of making art.You might think that this episode would be locked into discussions of trees and flowers, but I was highly intrigued by the work of Jan Yager, who uses drug paraphernalia found in her rough Philadelphia neighborhood and transforms them into visually interesting pieces of art. 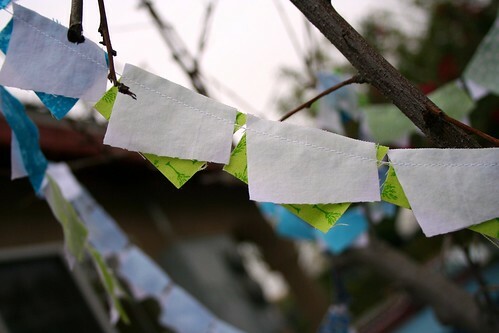 Her commitment to using materials found in her immediate vicinity — no matter how ugly or rough — is pretty inspirational. A break in the documentary’s form occurs when they highlight Timberline Lodge — a ski lodge built after the Depression by the Works Progress Administration which employed not only welders and brick-layers, but also apparently artists and craftspeople. It seems like a strange inclusion in the documentary, but it (mostly) works. This episode features glass artists, ceramicists, quilters, two more jewelry artists, another basket weaver, and a roster of craft schools and organizations. A quilt made for a loved one. A piece of jewelry passed down from one generation to the next. Crafts connect us to other times, other places, other people. How do simple, beautiful objects bind us together and how do they come to embody our sense of community? This episode sticks most closely, in my opinion, to its theme of community. It shows artists working in residences, schools, and other group settings. Readers of this blog will be glad to see that a modern quilting-bee community, Mississippi Cultural Crossroads, is highlighted. Not surprisingly, with the exception of the glassworkers (a craft which I imagine is extremely difficult to complete in isolation), most of the artists featured in this episode are women. This makes sense, given what we see of women finding communities of creativity even here online in blogland. The people and products in this documentary are so lovingly and generously filmed that it will sometimes take your breath away. I frequently wished that I could reach through my television to caress a particular curve of a rocking chair, or feel the weaved texture of a basket or a rug. Fortunately, the camera does a pretty good job of caressing for us. Truly, these episodes are shot with a cinematic view and there is plenty for the eye to take in. There are things about the documentary which fall a little short for me, too. For instance, I found the organizational structure of the episodes a little baffling. The worst offender of the episodes in this sense is Landscape — which inexplicably (and jarringly) leaps from highlighting artists who are making art based on their physical surroundings to an artist that makes art in protest of war. Huh? This episode also features Timberline Lodge, which is a cool collaboration of artists that came together during a difficult time and… therefore… wouldn’t it fit better in the episode called Community? Also, those of us who are trying to incorporate art wherever we can in our modern, average lives may have to dig a little to find useful ideas from these full-time, studio-based, livelihood artists. I believe the gems are there, but I had to kind of commit myself to not being jealous of their set-ups. That said, the quilters are of course just everyday women. None of us should find this to be much of a surprise, I guess. Finally, the “episode” format of this documentary is very tantalizing. My one remaining criticism is that there are only three episodes, with no apparent plan for continuation. If they could reduce the production value a little, we might get fewer sweeping vistas and perfectly-lit images of glazed pots, but if it would have resulted in a longer-running examination of art and artists, I would have been glad of it. Overall, I give this DVD 4/5 stars. The pros: Gorgeously filmed, beautiful work. Lots of artists are highlighted and they talk at length about their lives and their creative process. There’s an emphasis on getting back to handmade, simple objects and moving away from machine-made. The cons: Organization is a bit loose and, at times, jarring. Many of the arts and media highlighted are out of reach of the average Joe. Potential for an interesting, ongoing series is somewhat wasted with only 3 episodes. If you’ve seen this documentary (or choose to watch it in the future), please comment on it below! I wonder how many Works in Progress (WIP’s) and Un-Finished Objects (UFO’s) are sitting out there in blogland with confused artists behind them. What happened in the project to make the maker abandon it? What went wrong? Why did the spark of creative ambition get doused? Jacquie of Tallgrass Prairie Studio recently hosted a month-long warcry: Spring to Finish! 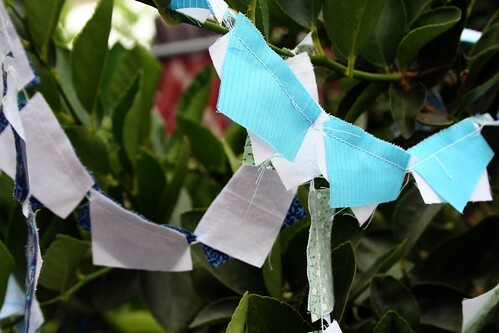 Nearly 100 makers pledged to complete their unfinished projects and report back. People, that’s a lot of unfinished projects! (If you think you missed your chance, BurdaStyle is running a similar sew-along until the end of May.) How do we end up with so many unfinished projects in the first place, and what shall we do about them? Maybe the projects are darlings that need to be killed off. Maybe there is one particular part of the process that you enjoy, but not another. Maybe you have a tape playing in your head that says, over and over again, You are no good at ______________ (matching colors, drawing perspective, hand sewing, glazing, black-and-white photographs, composition, punctuation, whatever). Maybe we get so many unfinished projects that it seems impossible to finish any of them. 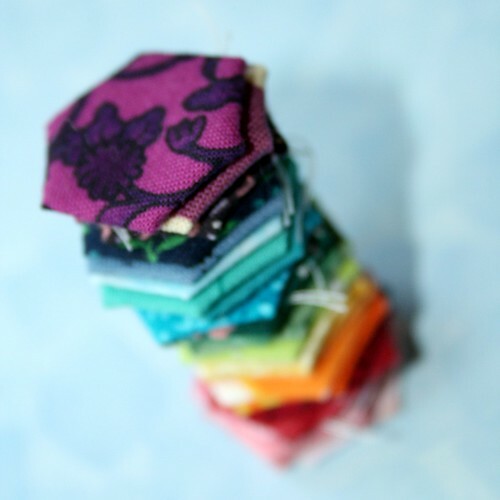 During the Great Sort that is going on in my apartment, I found a stack of pieced blocks from an old finished project. I don’t have that many works in progress, in general, so it sort of shocked me to find these unfinished blocks in a tidy stack. I don’t remember what I originally saved them for. They were left over from a large quilt project that I finished years ago. Now I’m going to follow Melissa’s lead and turn them into something altogether different than what they were originally intended. Can’t wait to show you. Sometimes self-help books and how-to articles and productivity gurus can get a bit esoteric about things like “How to get things done.” However, if you’re looking for some further reading on the why’s and how’s what-fors of finished and unfinished projects, try these. They’re not half bad. Trish Lawrence of Real Brilliant writes about why successful entrepreneurs must possess the skill of finishing things. Bethz at Apartment Therapy writes about How to Start and Finish Things. Psst! It includes turning things down sometimes. Game Developer Michal Marcinkowski takes a reverse-psychology approach in his article How to never finish your project. I felt so guilty when I read this, it must be awesome. Karen at Yarn is my Metier describes the mental and emotional noise that a stash of unfinished projects can cause. A potential solution from Suite101.com. It’s an expensive and a bit extreme version of a solution, but it might work for you. There are lots of systems for finishing things, but none of them work if you don’t put them into practice. The catch phrase “Finish or Frog” reminds us that sometimes it’s better to scrap a project than see it all the way through. 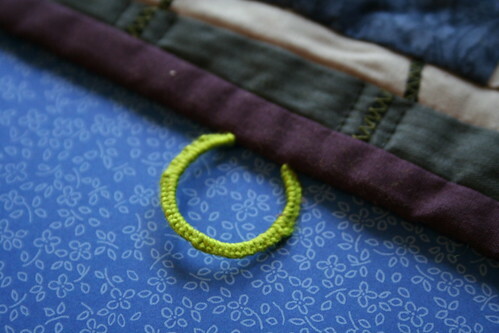 Frogging is the process of deconstructing and unraveling yarn projects. Read an interview about the project over at About.com. 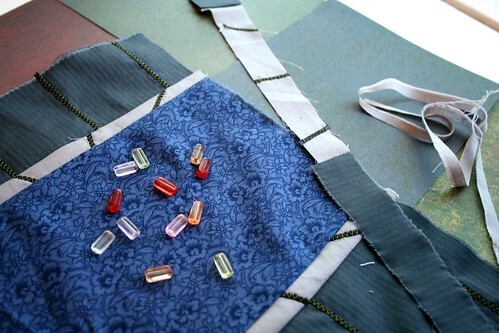 Barb Scala at BloomOnline recommends gathering everything together and then starting with the smallest/easiest finish. Then you’ll have a sense of accomplishment that will hopefully snowball and rid you of all that despair. And here is a link to the final “Spring to Finish” page at Jacqui’s Tallgrass Prairie Studio where people leave comments about how many projects they finished in April, 2009. If you need inspiration and motivation, this might do the trick! What keeps you from finishing your projects? How can you take something unfinished and turn it into something else entirely? 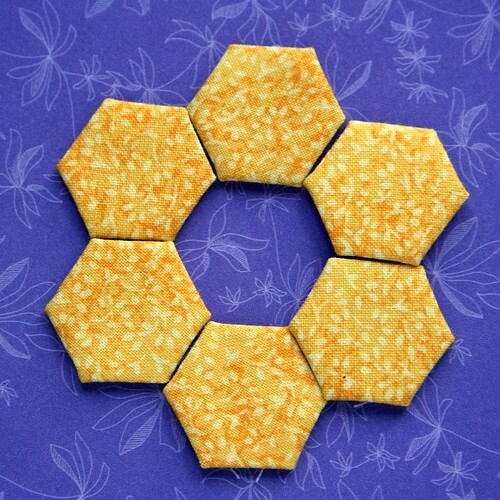 I finally figured out what was wrong with my mini-hexagon project. Don’t worry. It wasn’t anything major — only the whole entire concept from top to bottom. Fortunately I was able to switch it up pretty easily and get back on track. I also gained some good insight into some of the reasons why those hexagons have been compelling me so fiercely for the past few months. I’ll let you know more about that later. For now, here are a few thoughts on what to do when a project goes awry. First, from Annie Dillard‘s book The Writing Life. This wonderful book is, you guessed it, a book about the writing process. However, there is plenty about general creativity to be gained here. Please don’t feel too badly about extrapolating from writing instructions for your knitting, pot-throwing, jewelry-making, or other pursuits. A quick jaunt over to Annie’s website reveals that she herself has been painting in recent years. Go, Annie, go. The part you must jettison is not only the best-written part; it is also, oddly, that part which was to have been the very point. It is the original key passage, the passage on which the rest was to hang, and from which you yourself drew the courage to begin. No, don’t slip cyanide into your children’s chocolate milk. Instead, be willing to part with (slice off, scrub out, or frog) your very favorite part of a piece of art. If you’ve been laboring on any one aspect for too long, it runs the risk of becoming precious, overdone, and (for lack of a better term) priced out of its own market. It could be the very thing that is weighing you down. Read over your compositions, and wherever you meet with a passage which you think is particularly fine, strike it out. Here are a few more essays about the idea of killing your darlings, and an interesting sampling of creative media which appear to benefit from the advice. What about you? Have you? Would you? Could you? Should you?